It's a magic cookie! 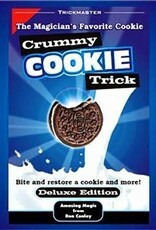 And it's a realistic looking Oreo type cookie! And you can do wonderful magical things with it! And it is VERY VERY EASY! You get a bunch of different tricks in one! It's a Bitten-And-Restored Cookie, a Vanishing Cookie, a Vanishing Penny and a Shrinking Penny- you decide! Place a penny on the back of your spectator's hand. Wave the cookie over the penny- instantly the penny changes into a dime! Place a penny on your spectator's hand, wave the magic cookie, and the penny shrinks into a miniature penny! 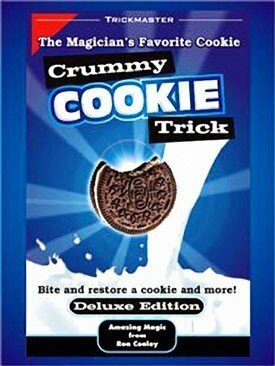 Toss the cookie into the air- it vanishes and reappears in your pocket! Take a bite out of the cookie, and instantly make it whole again! Now THAT'S a LOT of magic! !